You are here: Home / Why car LED headlight bulbs are more and more popular ? LED car headlights are gaining popularity as manufacturers and car owners prefer cheaper and more efficient bulbs. Replacing halogen headlights with LED headlights can lead to a better driving experience, and the price of these once expensive LED headlights is getting cheaper and cheaper, and the cost of upgrading is getting lower and lower. Below are some significant advantages of LED headlights. The LED headlight kit is easy to install and you don’t need to be a mechanic or have any specific technical skills to install it on your own car. In fact, the LED headlights can be installed with a minimum of tools, which takes about 20-30 minutes, saving the labor cost of installing the headlights. Or, if you’re not good at installing these, you can also bring your kit to any mechanic who will be able to install these LED car headlight kits for you at low cost. All of LVT LED headlight kits come with complete installation instructions to guide you through the process of installing LED headlights. Unlike halogen bulbs, halogen bulbs need to be replaced from time to time, and designed to run for up to 5,000 hours in a car. 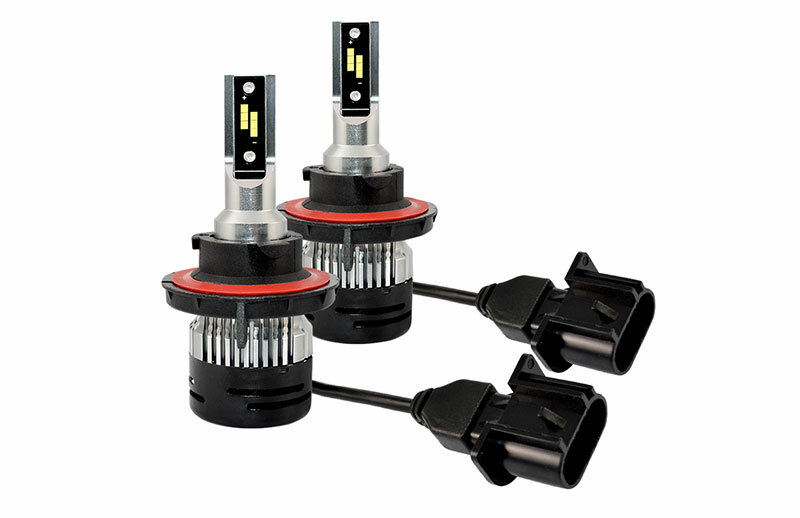 The LED headlights are stable in quality and have a long life span of at least 30,000 working hours. Using LED headlights will allow user with continuous savings in parts and maintenance costs due to their long service life. In the long run, the cost of LED headlights will be much lower than halogen headlight although LED headlights purchasing cost seems several times higher than halogen headlights. In terms of the brightness produced by LED headlights, it is significantly more efficient than halogen bulbs. Halogen bulbs consume 80% of the energy, producing 20% ​​of the light. LEDs convert 80% of the energy they use directly into light, waste only 20% in the process, and the efficiency is significantly improved. Consider night driving scenes or foggy road conditions. Halogen lamp shines a faint yellow light only a few feet in front of the road, and even reflects a dense fog, but LED headlight produces a more penetrating white light. This makes the driving conditions ahead clearer and makes it easier to see upfront under fog and other undesirable visibility conditions. As a result, car owners installing LED headlights have more time to cope with the changing conditions ahead, so they can be as safe as possible on the road. These are just some of the reasons why more car owners choose to switch to LED headlights, and industry forecasts are expected to turn to LED headlights in the next few years. For any car, to get a long term, efficient, high quality lighting solution, choose LED headlamps instead of standard halogen headlight bulbs is the right choice. If you are an auto parts reseller, distributor or importer considering to import LED headlights from China, please don’t hesitate to contact LVT AUTO, our quality LED headlight and perfect service will ease you all the time. Please email [email protected] in case of any LED headlight requirements. https://lvtauto.com/wp-content/uploads/2018/08/H13-car-LED-headlight-bulbs.jpg 518 800 Admin http://lvtauto.com/wp-content/uploads/2018/08/logo-dark-bg.jpg Admin2018-08-01 07:14:402018-08-29 08:53:30Why car LED headlight bulbs are more and more popular ?